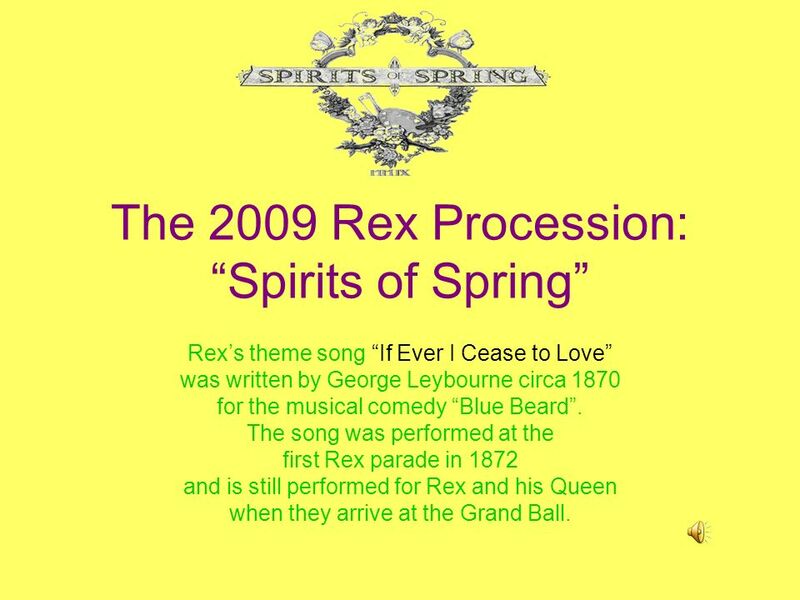 The 2009 Rex Procession: Spirits of Spring Rexs theme song If Ever I Cease to Love was written by George Leybourne circa 1870 for the musical comedy Blue. 1 The 2009 Rex Procession: Spirits of Spring Rexs theme song If Ever I Cease to Love was written by George Leybourne circa 1870 for the musical comedy Blue Beard. The song was performed at the first Rex parade in 1872 and is still performed for Rex and his Queen when they arrive at the Grand Ball. 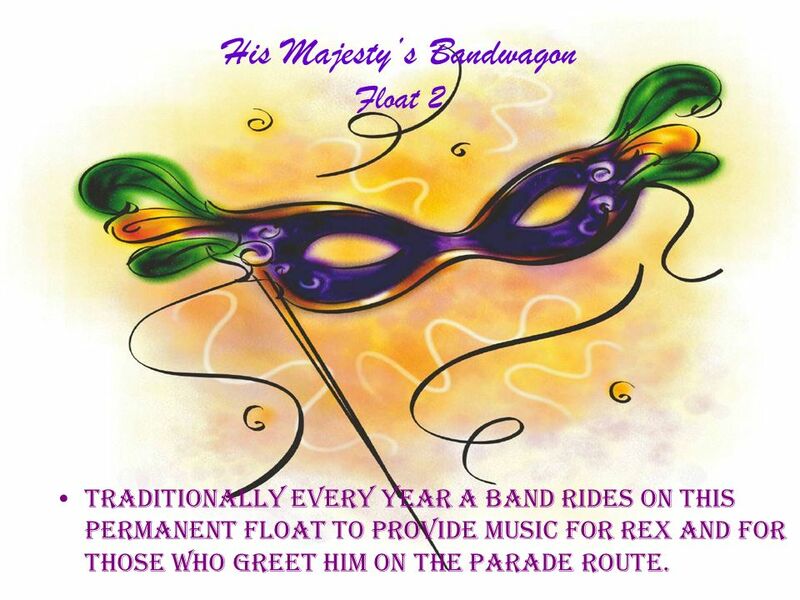 3 His Majestys Bandwagon Float 2 Traditionally every year a band rides on this permanent float to provide music for Rex and for those who greet him on the parade route. 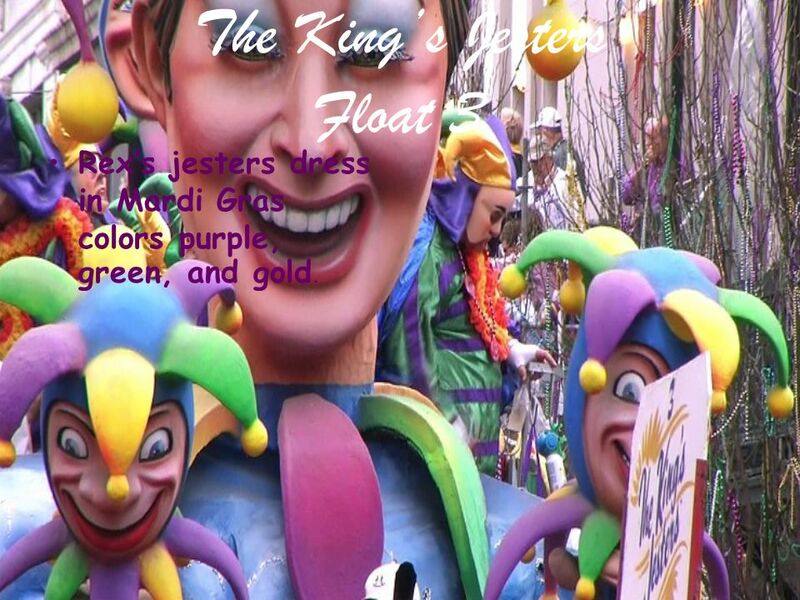 4 The Kings Jesters Float 3 Rexs jesters dress in Mardi Gras colors purple, green, and gold. 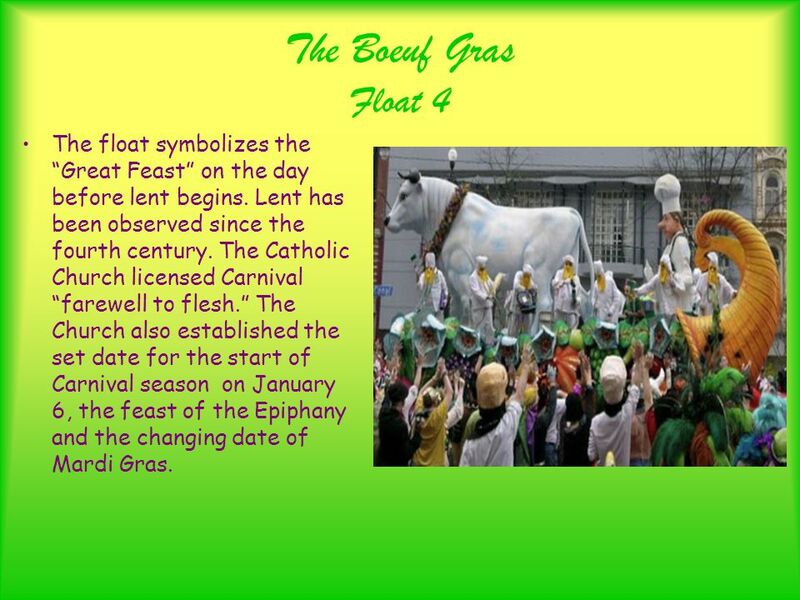 5 The Boeuf Gras Float 4 The float symbolizes the Great Feast on the day before lent begins. Lent has been observed since the fourth century. The Catholic Church licensed Carnival farewell to flesh. The Church also established the set date for the start of Carnival season on January 6, the feast of the Epiphany and the changing date of Mardi Gras. 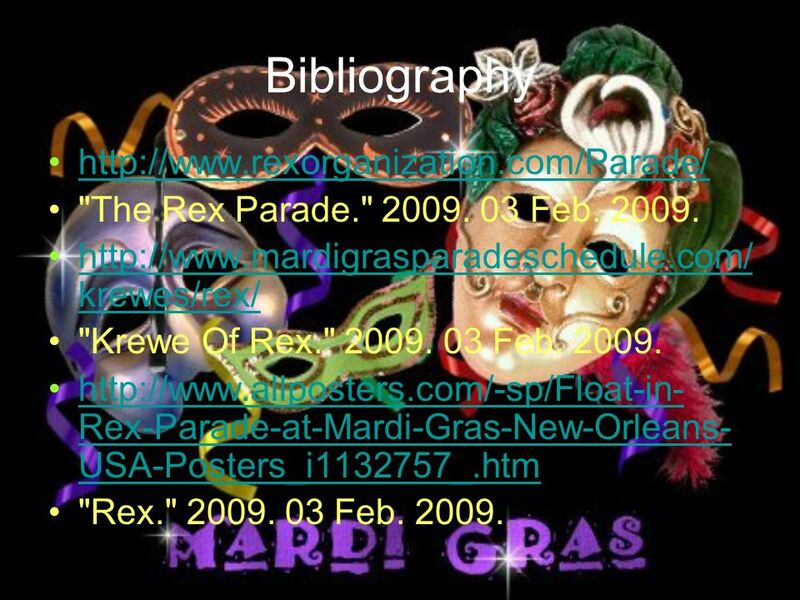 6 Bibliography http://www.rexorganization.com/Parade/ "The Rex Parade." 2009. 03 Feb. 2009. http://www.mardigrasparadeschedule.com/ krewes/rex/http://www.mardigrasparadeschedule.com/ krewes/rex/ "Krewe Of Rex." 2009. 03 Feb. 2009. http://www.allposters.com/-sp/Float-in- Rex-Parade-at-Mardi-Gras-New-Orleans- USA-Posters_i1132757_.htmhttp://www.allposters.com/-sp/Float-in- Rex-Parade-at-Mardi-Gras-New-Orleans- USA-Posters_i1132757_.htm "Rex." 2009. 03 Feb. 2009. 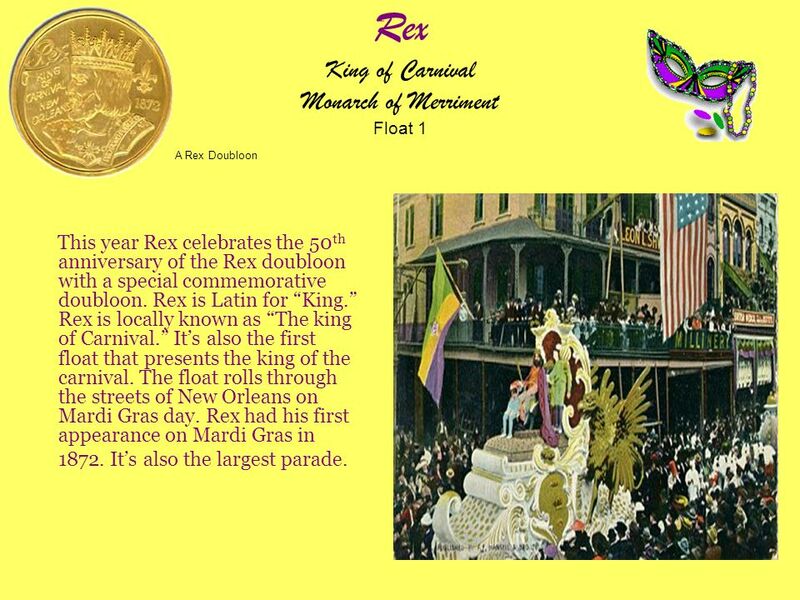 Download ppt "The 2009 Rex Procession: Spirits of Spring Rexs theme song If Ever I Cease to Love was written by George Leybourne circa 1870 for the musical comedy Blue." Chalchiutlicue Float 15 Chalchiulicue was an Aztec goddess. To her people Chalchiutlicue was seen as a flowing river, producing a prickly pear tree. The. The 2009 Rex Parade: All Fools Day Float 21 Cecilia. Three Kings Day The Epiphany. What is the Easter Season About? Western Easter Calendar Feb. 24 Fat Tuesday (Mardi Gras) Feb. 25 Ash Wednesday Feb. 25-Apr. 11 Lent Apr Holy. Mardi Gras Le 12 février L’histoire de Mardi Gras Many Christians and Roman Catholics celebrate “Carême” which means lent. It lasted 40 days They. Streetcar Named Desire float 14. The Streetcar Named Desirefloat 14The Streetcar Named Desirefloat 14 This permanent float honors the most famous of all. Mardi Gras is a time when people parade in the streets on float representing a theme. Thousand of people gather in the street to whatch the parade. Information. 1.Edgar Allan Poe Biography 2.Vocabulary Notes 3.Historical Background of story 4. Abstract/ Concrete Nouns 5. Comprehension Questions 6. Coat of Arms. MARDI GRAS Mardi 28 février Mardi 28 février Un petit jeu!! Un petit jeu!! Carnaval2013Carnaval2013. Carnival is a festive season which occurs immediately before Lent; the main events are usually during February. Carnival typically. Mardi Gras. Mardi Gras came to New Orleans (la Nouvelle Orléans) through French explorers in 1699. Mardi Gras. Mardi Gras came to New Orleans through its French heritage in 1699 Early explorers celebrated this French Holiday on the banks of the Mississippi. Fêtons Mardi Gras By: Madame Tulley Lincoln-Way Central High School World Languages Department. Carnaval De Panama By D.C. Terminology What is Carnaval ?  It started in the 1900’s when the country declared its independence from Spain, and was celebrated. Christianity By Ellie, Katie, Maddy & Rosanna Video Clip. CARNAVALCARNAVAL PowerPoint designed by Danielle Griffin, 2006. Mardi Gras in New Orleans. Mardi Gras is one big parade put on by the city in the French Quarter of New Orleans on Fat Tuesday where people drink a lot.